Long legs protruding from under a pale blue shirttail led Steven out the side door to the picnic table. He took a seat opposite Katherine, grateful for the table concealing the lower half of his torso. They sat quietly sipping their drinks for several minutes. “How old are you?” they asked in unison. “Jinx!” they both shouted, followed by hearty laughter, amused by the fact they played the same game despite living on opposite ends of the continent. Steven’s mouth formed a lopsided smirk. “Sounds awful.” He couldn’t imagine living in a big city like that. “But, I love it out here. I love Two Ponies!” she said. After collecting their towels in the kitchen, he followed Katherine along the trail to the dock. She talked nonstop, pointing out trees and flowers by name along the way, no doubt trying to impress him. But it wasn’t necessary; he was already smitten. Steven followed quietly as he carefully studied her, filing away every detail to memory. Even the simplest things, like the way she coiled her ruby hair around her finger as she spoke, captivated him. “Okay, the sun part sounds good,” he said, chuckling, earning a smile from the girl. They both laid their towels down and stretched out on their backs, head-to-head. Basking in the warm midday sun, eyes closed to the blinding sunlight, he could almost forget he was so close to a girl… a very pretty girl. “What does your dad do?” he asked, curious to know everything about Katherine O’Reilly. “The Yankees! No, the Red Sox are the best!” Katherine jumped to her feet. “Ted Williams is the best hitter ever… the Yankees stink!” she said, leaning only inches from his face. Katherine turned and jumped off the end of the dock, deliberately splashing him. Steven leaped in after her, yelling a stream of impressive Yankee stats. That’s how the remainder of the summer went—Katherine leading the way on trail rides, hikes, and in every way possible, with Steven tagging along behind. Katherine loved this newfound power, confident Steven would follow her anywhere. Shaking her hand longer than necessary, the Blackfeet finally released it and padded to the horses without making a sound as if walking on carpet rather than the forest floor. Flashing his gorgeous smile one more time, he hopped effortlessly onto the back of the gray, once again towing the black, and started for the creek. “Wait, what’s your name?” Katherine shouted after him. Again impressing her with his riding skills, he halted and spun the grey around on her haunches. As the mare stood mid-air, he answered, “Billy, Billy Black.” Before she could reply, the trio disappeared into the woods. Katherine stood motionless for several minutes where Billy Black had left her, mesmerized. When his spell lifted, she shook her head. What just happened? The whole turn of events seemed surreal, like she had just walked on and off of a motion picture set. Billy certainly was a character; falling somewhere between the Lone Ranger and Tonto. She couldn’t believe she had just hired a total stranger when she didn’t have the money to pay for one day’s wages. She was furious with herself. How would she explain her impulsiveness to Betsy and Steven? Then she remembered he had known her uncle. That would be her defense. After completing her task, Katherine paused at the end of the dock. She struggled to fight the impulse to linger, but the lake drew her in once more. Her skin began to tingle as her legs became numb. Unable to move, she fell into a well-rehearsed trance. Leaning over the edge, she searched the water for the answer to a question that had haunted her for nearly fifteen years. Why? Why did he do it? But, like the cold, empty gaze of a snake’s eye, the lake's dark surface only stared back at her through her reflection. She felt the body of water beckon her as the fog gradually consumed the dock and wrapped around her ankles. Could she do it? Could she let herself fall - not fight it - and surrender her last breathe… as he had? Teetering on the edge of the dock, something caught her eye across the vast expanse of water. For an instant, she swore she could see a lantern signal through the mist... or was it just a flash of moonlight reflecting off the distant shore? “Billy... ” she exhaled faintly. KATHERINE O’REILLY grew up a dreamer, believing all the excitement and romance of her favorite films and books could be captured and lived. By age thirty-five, she is suicidal. Unloved by her mother and neglected by her father, she believed earning the devotion of an exciting and charming lover would validate her self-worth. After betraying her best friends to obtain the man of her dreams, he is lost. Disillusioned, the riding instructor gives up on love and dedicates her life to her students and focuses on her love of horses at an equestrian camp nestled in the Rocky Mountains. Years later, while fighting to keep her riding school, she gets a second chance at love. Can Katherine let go of her past in time to save her future? 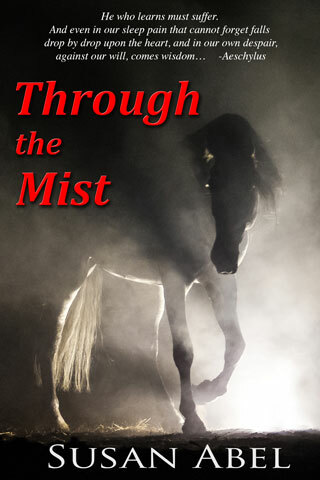 Set in the mid-1900s near a Blackfeet reservation in Montana and interwoven with themes of racism and American Indian theology, Through the Mist holds timeless lessons for women of all ages about self-worth, true love and letting go. The Indian looked Katherine over, apparently trying to size her up. She guessed most people might have reported him to the police, instead of offering him work. “Oh, really!” Katherine considered ending this conversation and walking away. Perhaps this young man was trouble, but somehow that seemed to intrigue her all the more. Suddenly, he pulled a knife from a sheath tied to his pant leg. Katherine gasped and stepped back. For a moment she feared she had been foolishly reckless. Had she somehow offended him? She was relieved when he cut a piece of bark off a nearby tree and carved his number onto it. “Sorry, I’m not accustomed to people carrying a knife,” she said. Katherine extended her hand confidently, hoping to impress him with a firm handshake. Instead, her hand shook uncontrollably when they touched. He was the one who was cool and collected. From one moment to the next, she couldn’t decide if she was more annoyed by him or more captivated. But one thing she knew for certain—she looked forward to seeing him again. “I’ll call you Monday,” she said in the most professional sounding voice she could muster.